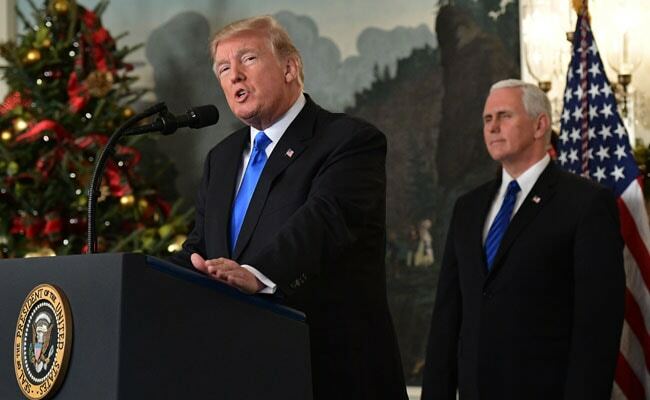 New York, Dec 7: United States President Donald Trump on Wednesday formally recognised Jerusalem as the capital of Israel in the face of international criticism while asserting that he was "not taking a position of any final status" of the ancient city that is also claimed by Palestine. United Nations Secretary-General Antonio Guterres, speaking immediately after Trump's announcement, delivered criticism couched in diplomatic terms, saying he was "against any unilateral measures that would jeopardize the prospect of peace for Israelis and Palestinians." "Jerusalem is a final status issue that must be resolved through direct negotiations between the two parties on the basis of the relevant Security Council and General Assembly resolutions, taking into account the legitimate concerns of both the Palestinian and the Israeli sides," Guterres added. Trump invoked the a 1995 law passed by US Congress calling for moving the US embassy from Tel Aviv to Jerusalem, to justify fulfilling his campaign promise. As he pointed out, his three predecessors, Bill Clinton, George W. Bush and Barack Obama, issued waivers putting the law on hold but he was now following the intent of the Congress. While nations and leaders, from China to Pope Francis criticised Trump's decision and even US allies have refused to follow Washington's lead on moving embassies to Jerusalem, there was no noticeable political opposition in the US from even the Democrats. In the US, politicians are loath to be seen as anti-Israel and Trump's move was a challenge to his domestic critics to make it a major politically issue. Trump's announcement muddies the diplomatic waters in the Middle East where his son-in-law Jared Kushner is engaged in a so-far unsuccessful peace effort to bring Israel and Palestinians together for a solution to the contentious issue. "The United States would support a two-state solution if agreed to by both sides," Trump said. "I intend to do everything in my power to help forge such an agreement." While declaring that he would ask the State Department to move the embassy to Jerusalem, he added, "This decision is not intended, in any way, to reflect a departure from our strong commitment to facilitate a lasting peace agreement." "We are not taking a position of any final status issues, including the specific boundaries of the Israeli sovereignty in Jerusalem, or the resolution of contested borders," he added. "Those questions are up to the parties involved." That leaves the room for Israel to have West Jerusalem as its capital, while Palestine has its capital in East Jerusalem, a territory that Israel captured during the 1967 Middle East War, if there is an eventual peace agreement between the two sides. Trump's announcement is directed towards his domestic base, rather than the world. Almost a year into power, he has failed to fulfill most of his campaign promises ranging from building a wall along the Mexican border to abolishing his Obama's health insurance programme. The only high-profile promise he was able to achieve was a tax reform. Now he can add Jerusalem to that without his opposition turning it into a divisive issue.